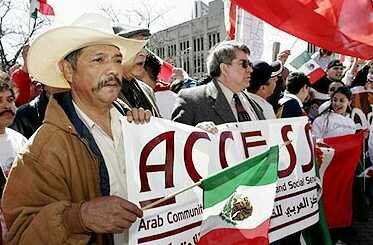 March 27 illegal alien protest in Detroit. Marchers carry a bnner for the Arab Community Center for Economic and Social Services. Background here. "If you watch TV and read the papers, you would think this [immigration reform] is primarily an issue only for Latinos or only illegals or only poor immigrants. [Monday] will show differently," predicts Abdul Malik Mujahid, a Chicago-based Islamic cleric who says 7,000 Muslims will march there Monday to protest the "climate of fear" since 9/11. Mujahid is the President and Director of Sound Vision Foundation Inc. He is an Imam in the Chicago area. A graduate of Darul Uloom Shah Waliullah in Islamic Studies and the University of Chicago in Political Science, he has learned television production as director and producer at the Chicago Access Corporation. He is the producer of Sound Vision's programs. He was also responsible for the concept and design of Al-Qari, the leading Quran learning multimedia software. Mujahid has served as the National Coordinator of Bosnia Task Force, USA. It was in this capacity that he initiated the formation of the Islamic Shura Council of North America. He also serves as National Coordinator of Kosova Task Force, USA, an alliance of 10 national organizations of Muslims in America. Mr. Mujahid also serves at the executive committee of the Council for a World Parliament of World Religions. *Foreign-born militant Islamic terrorists have used almost every conceivable means of entering the country. They have come as students, tourists, and business visitors. They have also been Lawful Permanent Residents (LPRs) and naturalized U.S. citizens. They have snuck across the border illegally, arrived as stowaways on ships, used false passports, and have been granted amnesty. Terrorists have even used America’s humanitarian tradition of welcoming those seeking asylum. *At the time they committed their crimes, 16, or one-third, of the 48 terrorists in the study were on temporary visas (primarily tourist visas), another 17 were Lawful Permanent Residents or naturalized U.S. citizens, 12, or one-fourth, were illegal aliens, and three of the 48 had applications for asylum pending. *Although the 9/11 hijackers entered on temporary visas, LPRs as well as naturalized U.S. citizens have played key roles in terrorism on U.S. soil. For example, Siddig Ibrahim Siddig Ali, ringleader of the plot to bomb New York City landmarks in 1993, is an LPR, and Ali Mohammed, who wrote al Qaeda’s terrorist handbook on how to operate in the West, is a naturalized U.S. citizen. *The nation’s humanitarian tradition of offering refuge to those fleeing persecution has also been exploited by a number of terrorists. In addition to the three terrorists who had asylum claims pending when they committed their crimes, three other terrorists, such as Gazi Ibrahim Abu Mezer, who tried to bomb the Brooklyn borough subway in 1997, used a false asylum claim to prevent deportation prior to taking part in terrorism. *Violations of immigration laws are very common among terrorists. Not only were 12 of the 48 terrorists illegal aliens when they committed their crimes, at least five others had lived in the country illegally at some point prior to taking part in terrorism. At least five others had committed significant violations of immigration laws prior to their taking part. For those that were illegal aliens, most entered legally on temporary visas and then overstayed. However, some snuck across the northern border, such as Abdel Hakim Tizegha, who was involved in the Millennium plot. *In addition to overstaying a visa, terrorists have violated immigration laws in a number of different ways. Some terrorists have engaged in fraudulent marriages to American citizens, such as Fadil Abdelgani, who took part in the plot to bomb New York City landmarks, and Khalid Abu al Dahab, who raised money and helped recruit new members for al Qaeda from within the United States. *Terrorists also violated immigration laws by providing false information on their applications for permanent residence, such as Sheik Omar Abdel Rahman, who inspired several terrorist plots. * Still other terrorists have violated the law by working illegally in the United States. At least eight terrorists held jobs for extended periods while living in the country illegally before taking part in terrorism, including those involved in the 1993 Trade Center attack, the plot to bomb New York landmarks, and the Millennium plot. * A lack of detention space has allowed several terrorists who had no legal right to be in the country to be released into the country. For example, Ramzi Yousef, the mastermind of the 1993 World Trade Center Attack, did not have a visa to enter the country, but he applied for asylum when he arrived at JFK airport and because of a lack of detention space he was paroled into the country. * Past amnesties for illegal aliens have facilitated terrorism. Mahmud Abouhalima, a leader of the 1993 Trade Center bombing, was legalized as a seasonal agricultural worker as part of the 1986 amnesty. Only after he was legalized was he able to travel outside of the country, including several trips to the Afghanistan/Pakistan border, where he received the terrorist training he used in the bombing. * Past amnesties have not hindered terrorism. Mohammed Salameh, another conspirator in the 1993 Trade Center bombing, applied for the same amnesty as Abouhalima and was denied. But, because there is no mechanism in place to force people who are denied permanent residency to leave the country, he continued to live and work in the United States illegally and ultimately took part in the 1993 attack. * Several terrorists should probably have been denied temporary visas because they had characteristics that made it likely they would overstay their visa and try to live in the United States illegally. Under Section 214(b) of immigration law, individuals who are young, unmarried, have little income, or otherwise lack strong attachment to a residence overseas are to be denied temporary visas. Several of the 9/11 hijackers, including the plot’s leader Mohammed Atta, fit these criteria. * The visa waiver program, which allows individuals from some countries to visit the United States without a visa, has been exploited by terrorists. French-born Zacarias Moussaoui, who may have been the intended 20th hijacker on 9/11, entered the country using the visa waiver program. Other terrorists such as Ahmed Ajaj, Ramzi Yousef, and Ahmed Ressam attempted to use false passports from visa waiver countries to enter the United States. * The vast majority of terrorists in the study (41 of 48) were approved for visas by an American consulate overseas prior to entering the country. Of the seven who did not have visas, three snuck into the country and four arrived at a port of entry without a visa. * At least two terrorists, Sheik Omar Abdel Rahman and Ali Mohammed, should have been denied visas because they were on the watch list of suspected terrorists. Check out Debbie Schlussel for more.